Hey guys, so it's been quite a while since we've updated this blog. Anyhow, here it is...What we've been doing! Now, enough of that talk. Back to the subject of interest. What is the subject of interest you may ask? Well, the team T.n.T has decided to raise money for children back in the home country, Vietnam. After visiting my home country I realize that there are numerous individuals much younger than you, than me, and even my little brother! Yes, I know, even my little brother! Well, it's a heart breaking story. I contributing positively for once...and decided to help raise money and send it back to my relatives in Vietnam, and donate the rest of the money to the Buddhist Monastery Chua Phat Quang. There, the monk will send money back to the poverty-stricken children. 100% of the PROCEEDS, will go to charities. To prove it, us T.n.T ninjas will provide videos and pictures of us sending it to these children. Although we haven't had any videos in a while, I've been keeping up with my training, and so next time I get an opportunity to make a video, I will do so. My brother and I have just completed our taekwondo promotion tests, practicing our techniques. Now that the promotion is over, I will work on my acrobatics as well as my martial arts. Right now, i am just waiting for my pay cheque so I can buy a new camera for recording. Also, the new symbol is complete: it just needs some finishing touches. 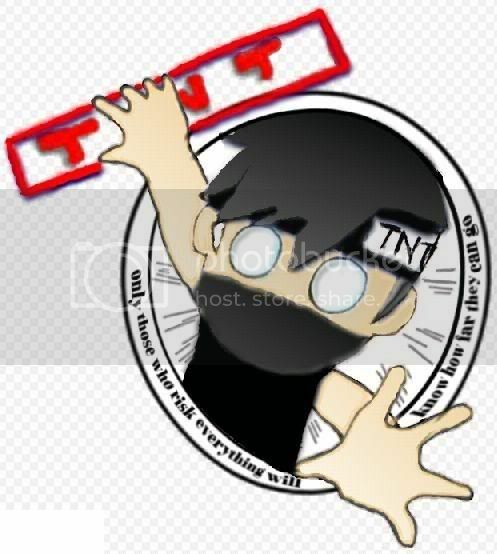 In addition, my friend will be drawing out a new T.N.T team symbol, and hopefully from there we will expand, allowing more awareness of our purposes. If you have any ideas for ways to help fund raise, please contact me, or comment on the blog. Please click on the ads provided by Google and all the funds generated will be donated. Also, please check back regularly for updates. Hey guys, we are team T.N.T, a martial arts tricking stunt team. Team T.N.T was formed thanks to the brainchild of Darron, with the help of Viet-Nhien and Daniel, who came up with an idea to create a martial arts tricking team while on road trip on December 24, 2008. Since then, we have grown. Now, on July 5, 2009, T.N.T ninjas are now associating ourselves with Nam Tran's project of creating a charity for poor children, earning money to buy the needy children school supplies. You can also help by clicking on the ads from this page. 100% of the funds will be donated.